In January 2015, Malaysian police officers were patrolling a remote stretch of the Thailand-Malaysia border when they made a startling discovery: a cluster of makeshift cages, draped in tarp and fenced in with barbed wire, with dozens of people trapped inside. It was part of more than two dozen human trafficking camps found near Wang Kelian, a sleepy Thai border village. 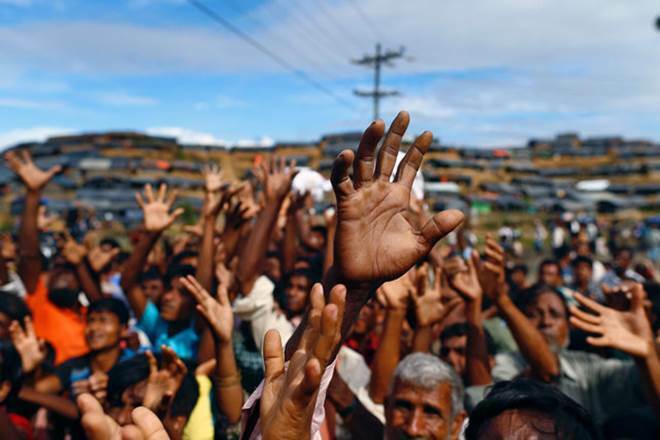 The captives were primarily Rohingya, Myanmar’s persecuted Muslim population. Near the same site, Malaysian authorities would later uncover a mass grave that held the remains of 152 people. But a report released last week sheds light on a different aspect of Rohingya’s suffering: a covert criminal network that trafficked tens of thousands of people. The authors accused the criminal network of committing crimes against humanity. The report, a collaboration between Fortify Rights and the Human Rights Commission of Malaysia (SUHAKAM), is one of the first to catalogue the atrocities Rohingya faced outside of Myanmar. The report found that thousands of Rohingya were confined in human trafficking camps in Malaysia and Thailand at any given time. Traffickers homed in on Rohingya in refugee and detention camps in Bangladesh and Myanmar, promising lucrative employment and Malaysian citizenship. Rohingya were then crammed onto fishing boats, sometimes by the thousands, and stripped of their belongings. From 2012 to 2015, the height of the trade, the United Nations estimates that more than 170,000 people boarded ships bound for Malaysia and Thailand. Many Rohingya died at sea — there were more than 112 deaths between 11 boat journeys from Myanmar to Thailand between 2014 to 2015, according to the report. Some died of thirst or starvation, others were killed by the traffickers or committed suicide by jumping into the open waters. Those who survived the journey were sent to secret jungle camps such as Wang Kelian. Victims were told they could pay the equivalent of roughly $2,000 in exchange for their freedom — those who were unable to raise the funds were sometimes killed. Women and girls in the camps were systematically sold into forced marriages or domestic slavery. Identities of the leaders are largely unknown, though the report found that those at the top of the trafficking syndicate were Malaysians and Thais. Smith noted that there were “some Rohingya people at the top,” but, citing security concerns, could not provide additional information. Uncovering the identities of trafficking kingpins is difficult because the key players tend to be invisible to the victims, according to Martina E. Vandenberg, president of the Human Trafficking Legal Center. But by monitoring financial transactions, Thai prosecutors were able to directly implicate a Thai lieutenant general in the Rohingya human trafficking network. He was found to have received upwards of $1 million dollars (3.49 million Malaysian Ringgit) in bank transfers from the criminal syndicate. The trial led to the conviction of 62 people, including an additional eight government officials. A similar financial investigation on the Malaysian side of the border has not yet taken place, but the report’s team members are pressing authorities to follow the money. “It’s excellent for the purposes of identifying the actual ringleaders and answering the question: who profited the most?” Vandenberg said. The United Nations estimates that each ship earned traffickers $60,000 and that the criminal syndicate organizing the boats generated between $50 and $100 million annually. The report also finds that Malaysian authorities may have obstructed justice in their handling of evidence from the Wang Kelian camps. A senior police officer ordered the destruction of a camp the day after it was discovered. (A Malaysian police officer told the report’s authors that destroying a crime scene after it has been photographed is routine and is a way of deterring future crimes at the site.) In addition, authorities did not request the exhumation of mass graves until four months after they were found. By the time forensic experts were on the scene, excessive decomposition made it impossible to determine the cause of death. The Malaysian government established a commission to investigate potential crimes committed at the Wang Kelian in February. The commission, expected to publish a report on its findings within six months, indicates fresh political will to hold traffickers accountable. Meanwhile, though numbers have subsided, the trafficking of Rohingya continues — Smith says he received credible reports that boats of trafficked Rohingya arrived at Malaysian shores two weeks ago. Wai Wai Nu, a prominent Rohingya advocate and founder of two nonprofits, says the human trade of Rohingya is directly linked to the ongoing mass atrocities in Myanmar.